One of the many odd things about social media and being constantly in touch with everyone and everything at all times is that now, no matter how indifferent you may be, you will have no excuse not to know that it’s World Cat Day. Or National Wiggle Your Toes Day. Or Respect for Parents Day. How those wildly disparate things all merit the same notice is strange, to say the least. Just have a look at this calendar, and have a good laugh. Go ahead. I’ll wait. . . . Funny, isn’t it? Yes, there is a National Underwear Day. Not sure what you’re supposed to do that day, but it’s on the calendar! You may have noticed that August 24 is National Peach Pie Day…but here is something even better: the entire month of August is National Peach Month!! Apparently someone somewhere has the job of assigning this sort of thing. At least this is something that the Brampton Inn can get behind with gusto! You may or may not remember that peaches were grown here, on the property that is now Brampton, back in the 19th century. Which makes us all so happy because we LOVE this late summer fruit! So when peach season comes around, every July through August, we are not shy about serving the luscious fruit every chance we can get. When a peach is ripe, it is one of the most perfect things in the world. Sweet and juicy and good for you. Peaches are a good source of Vitamins C & A, fiber and potassium. They’re versatile, too. Sweet or savory preparations that include peaches are always a hit. 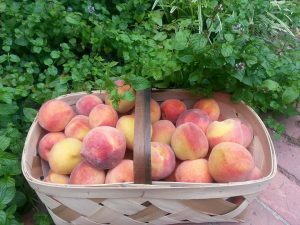 Besides the pies, cobblers, cakes and muffins, don’t be surprised to find some peaches in a salsa with corn and basil, or grilled with honey and balsamic vinegar as an accompaniment to a pork dish. So, in honor of Peach Month, and whatever National Day it might be, here is a quick rundown of how to grill your peaches. This qualifies as one of our simple cooking ideas that pay off big time, such as we’ve shared in the past here and here. First, get some peaches. Fresh and local, if possible, from your farmers’ market. We get ours from Godfrey Farms in Sudlersville, Maryland. They should be ripe, but not mushy. Save those for jam or cobbler! Wash them, cut in half and remove the stone. In a glass baking pan, pour a little orange juice, enough to cover the bottom of the pan. Drizzle some honey (or agave, or maple syrup) over the juice. Set aside. After they’ve been turned over, let them sit on the grill for another minute and then remove from grill pan and place flesh side down in the orange juice-honey mixture. Let them soak up some of the juice; swirl them around in it for a bit. Then turn over and place in a 350 oven for about 5-6 minutes, or however long it takes for them to be able-to-be-eaten-with-a-spoon tender (as opposed to fork-tender) When they’re ready, serve them with a dollop of yogurt and some granola, as we did here if they’re for breakfast. Or you could use a little ice cream, sherbet or gelato and berries for a nice dessert, along with a simple cookie. To vary this idea for a savory application, you would add less honey or other sweetener, and add some herbs (think rosemary or thyme), maybe some fresh ginger. After grilling and baking, drizzle with the flavored balsamic vinegar of your choice. Substitute lime juice for the orange juice and add fresh cilantro and a pinch of chili powder at the end for a different take. It’s another non-recipe that you can adapt to your menu and your tastes. So if you visit us at the Brampton in August, don’t be surprised by the peaches that seem to be everywhere you look. We welcome them, and you, with open arms!